Wes Durston took three wickets on the third morning as Derbyshire were left with a target of 72 to beat Northamptonshire at Wantage Road. At lunch, they reached 11-1 with Hamish Rutherford out on second ball. 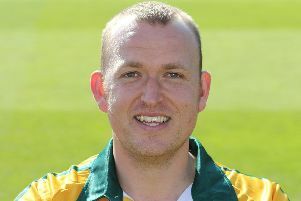 Durston produced the breakthrough after 75 minutes, removing Ben Duckett who had gone through to a first-class best 154. Duckett went past his previous best of 144 not out, made at Taunton last season, and brought up 150 in 206 balls but trying to drive Durston, edged a ball that bounced a little outside off and was caught at second slip. Another Durston delivery that bounced a touch took a wild edge from Rory Kleinveldt trying to play a lofted drive and looped to backward point. Durston’s third wicket came as Josh Cobb heaved a pull to deep midwicket. He had shared a stand of 54 with Duckett relatively untroubled but when he was dismissed for 32 any chance of Northants setting a testing target went.